I've been thinking ... oh just shaddup & listen. Why go to the LBL to hunt w/ your regulator hunting partner when you have so many other devote coyote hunting friends there? I would love a chance to hunt w/ JD, Ronnie, Rich, Joel, James, er any one of you guys. I'm thinking like have two hats, one w/ guys that have shot less than 10 coyotes (I'm just throwing out numbers), & the other w/ the more experienced guys. Draw a name from each hat to be the partners. At night have two drawings one for the morning hunt & the other for an afternoon hunt. Come in at noon, eat & switch partners. Something like that? If you had hunted together before, draw again. 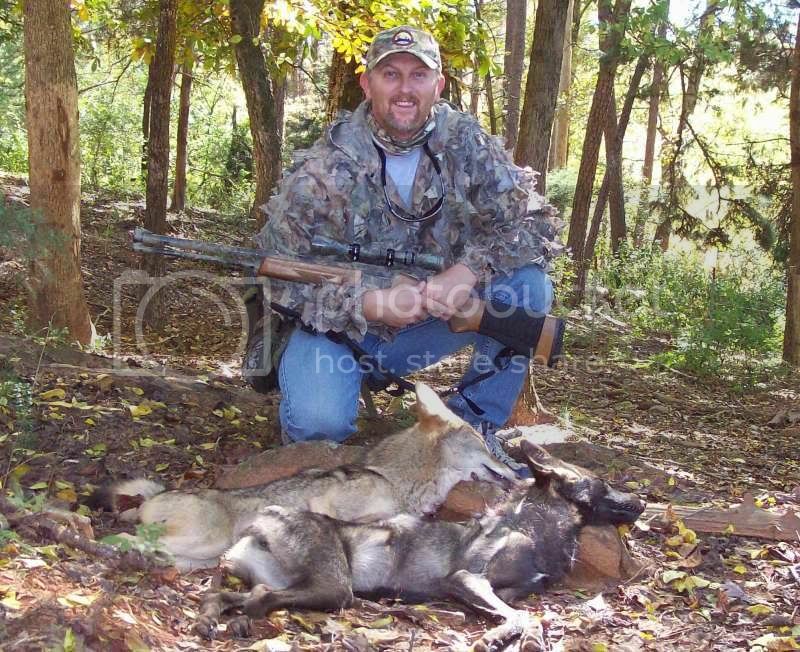 I know if I hadn't hunted w/ a guy that had gotten fur on the ground (205, remember him JD) my coyote stuff would have been on e-bay. I was over 10yrs before getting a coyote. Not that 205 & I got any coyotes; we didn't, but I found out my calling was good. 205 said so! I'm not saying that this would be manditory by any means, but for those that participate I think it would make the time a much richer experience for those that learned & those that taught. That sounds like a good idea to me. I can't talk for JB but I like the idea. I certainly would like to see how other people handle their setups and calling. I think it cam make you a better hunter, plus give the newer guys a chance to maybe see some things they are doing wrong or how things can be done a little differently. For example: Brent & JD way want to hunt together for video purposes. Great I have no problem w/ that. Voluntary: that's a good word for it. Sounds like a good idea, but then there are us guys that don't have a partner to swap and don't know anything about hunting. What do we do? It would be good to take those that are familair with the area and put them with others who have experience. In fact Ky Fishrman voiced this idea to me a while back. Or just those more experience with those with less. This is a good idea for those that want to do it. Just be careful. The first year we had the LBL hunt, poor old Chet got it stuck to him good. I had only be hunting coyotes for a few years, just a year or so of it with Chet.........which for all practical purposes I was still green as grass. Then a guy that went by the handle of "Doc" joined us and he had never hunted coyotes at all. He was a good guy, so we didn't mind him coming along. Then we had this yardbird that went by the handle of "Red Baron". Now this guy was a character. He had never been coyote hunting either and was real excited about learning. He knew everything there was to know about everything......... .except coyote hunting. Anyway, talk about your challenge for Chet. He was hunting unfamiliar territory........a few scouting trips and some maps didn't hardly make the LBL "home turf". He had three cherries with him, two of which had never hunted coyotes. He had to try and find places to set-up for four people.........try that sometime when your feeling froggy. We had made a few sets that morning and then went into Dover to get something to eat. Chet stopped to get gas and the rest of us stayed in the truck. Chet had no more than got out of the vehicle when Red Baron started telling me how we needed to do this differently and that differently........ he proceeded to pretty much say that everything we were doing was wrong and that I should inform Chet of this. NOW boys......I play the fool on here some, but don't ever take me for one. I knew that my big buddy Chet was already somewhat aggravated at the "circumstances" and I wasn't about to tell him that the way he had hunted coyotes for 30 years was wrong according to Red Baron's school of thought. Chet's as fine a fella that walks the earth, but everyone has their limits. Don't ask someone to show you the ropes and then tell them they are wrong........Baron was a moron. Anyway, I said all of that to say this. I believe I'm gonna hunt this year with my old buddy. We don't get as much hunt time together as we use to and he's my mentor. To those of you that are blessed enough to have an experienced coyote hunter take you under his wing at LBL. Please keep your mouths closed and your ears open........I've chatted with a few of you and doubt any will be as dumb as the Baron was, but just thought I would add that. There's an old saying, "When the student is truly ready to learn, then will the teacher show up". I do plan on getting with Stan the Man, Ill. Coyote and a few others while I'm up there to talk with them and listen to their calls, how they set-up, etc. I have been thinking about that problem too Bopeye. Not a lot of people have done three man setups . And three man is about all a good caller can handle well. And when your doing a four man setup someone is going to believe he is being left out when in fact, the caller is trying to cover all the bases, or aproach lanes in this case. What th newbie would be seeing is that callers style of working. It may be diferent from what they thought it should be or what they have done succesfully in the past. This hunt is all about learning the sport. I even learn from some who come and still am. I ran my estress chirp by Stan and Brian last year since they were the first in the country I knew of using it. They were using it before Randy Anderson made it popular, they had heard it in the field them selves. I don't have a problem with this at all. We are always happy to have a guest come along and hunt with us. Kytimberman, came along last year for a day, Steve M the year before, I enjoyed those guys hunting with us! I will be more than glad to set back and call with the camera man or trade out calling duty's with who ever hunts with us. We do this allot, we have had as many as 5 on a stand at one time. Just takes a little work but no big deal, thats what makes this sport what it is! I agree it takes a little work Kee, but when the calling area is new to you as well. Let's just say that I believe your chances for success diminish greatly with each person you have, especially if one of them is real fidgety and already "knows it all". I can honestly say I kept one eye on Baron the whole time we hunted. To say that he was reckless with the way he handled his rifle would be an understatement. I totally under stand! I been there myself. And I agree the more people on a stand the lower you odds go, no doubt about that. I wasn't disagreeing with what you said, hope you didn't take it that way. I guess the point I was trying to get across was that I don't have a problem with anyone comming along with us for a hunt just because we film. I enjoy hunting with other guys, and enjoy seeing the way they do things as well. We had a blast out in AZ hunting with someone diffrent every day, we hunted with as many people as we could while we were there in Oct at the camp out. Oops.......Yep, I totally misunderstood what you were saying Brent. My humblest apologies. That is the one drawback to these dadgum machines sometimes. We can read the words, but can't always see the intent of their author nor who some comments are directed towards. Once again, sorry for misunderstanding you. The "Red Baron" how can I forget he does know everything just ask him if you don't believe me. First coyote hunting trip he made was with me in Nashville TN. 1st set he told me I was setting up wrong. He had watched some videos and read some post on the board and had it all figured out :roflmao:. I cant count how many people through the years that have went hunting with me and after a month or two started telling me how to hunt coyotes. Back to the subject. I know it is frustrating having more than 2 people on a stand tried it don't like it. I would love for me and ccp2 to get a coyote on film at LBL. We will probably hunt mostly by ourselves but we will be more than happy to take someone on a few sets that Saturday. I like the idea....just need to be sure to reiterate that it's not a mandetory thing. Some might not want anybody with them, some will be looking for someone. I've shot more then 10 coyotes, but I can tell ya right now...haul me to Kentucky, push me in the woods with a rfile and I'm back to newbie status. but I can tell ya right now...haul me to Kentucky, push me in the woods with a rfile and I'm back to newbie status. We'll put some sleigh bells on you.........it will make you easier to locate. You do know how to squeel like a pig......eh? That ten coyotes thing is why I think it might be better to pair a newbie, familiar with the area, with a more exprienced hunter from elsewhere and vice versa. I talked with the Timberman about this today. I believe he was having too damned much fun to really consider the idea though. GC will be the only one from out of state that will be familair with this type of hunting since the terrain is so similar to where he hunts. Yet he too will be slightly out of his own element. Just as Chet is, it is similar to where Chet hunts yet diferent in a few ways. This is a very good thread and I hope more folks who are planning on going to the LBL hunt will weigh in and speak their mind about what they would like to do and not do. Be frank and speak your mind. I expect there are a few experienced callers that, given the choice, would like to hunt with other experienced guys, etc. Then there are guys like me. I'm not familiar with the LBL and my next called in and shot yote will be my first. I think it would be great to go just to put faces with screen names, but I also wonder if it makes sense for me to drive 800+ miles to do that [possibly] around the camp fire and spend my hunting time in unfamiliar terrain, hunting solo, and probably purpetuating ill concieved setups and calling tactics. Please understand, I don't expect or want anyone to feel like they need to baby sit me. I'm just weighing my personal alternatives and wondering out loud if maybe I should defer an LBL trip and focus on getting more proficient through continuing my local efforts and leveraging a few personal invites I have. This is not sour grapes guys. I feel like part of this community, but I also feel I'm lacking much in the skills and experience vs many [most] of you. I want to keep learning, but not at the cost of being a burden. I'm just not sure it makes sense for me at this point even though there would be some memorable moments for sure. There...I said it. I hope others also post their views and comment.